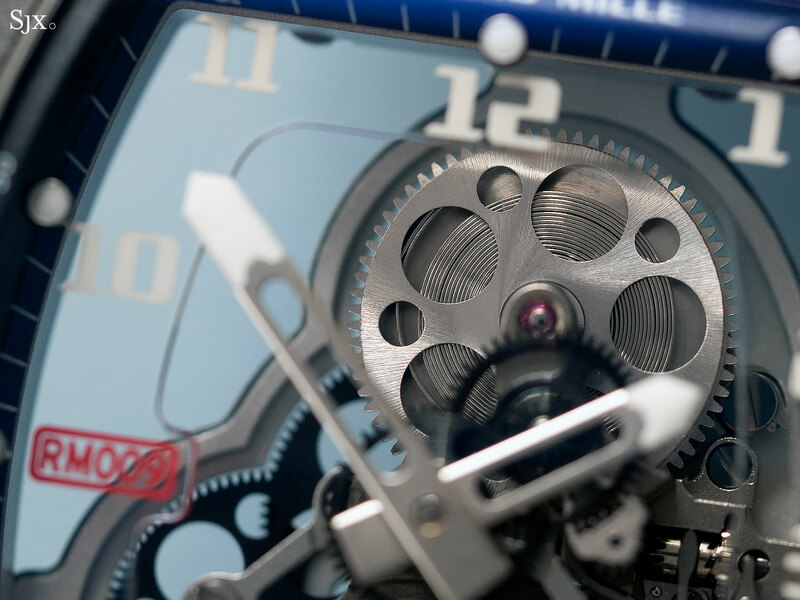 Arguably the most significant Richard Mille watch is the RM009 Tourbillon Felipe Massa, because it was the very first Richard Mille wristwatch that was ultra-light, now a defining characteristic of the brand. And it helps that the RM009 is ridiculously cool – a preposterous, flawed watch built on a bizarre idea that wears like a dream on the wrist. Introduced in 2005, the RM009 weighs just 28g without its strap, equivalent to five and a half sheets of ordinary printer paper (which is 80gsm weight and A4 size). Though it’s since been superseded in the weight stakes by other Richard Mille watches – notably the RM 27 series made for tennis champion Rafael Nadal, which includes the 13g RM 27-01 – the RM009 is a landmark. 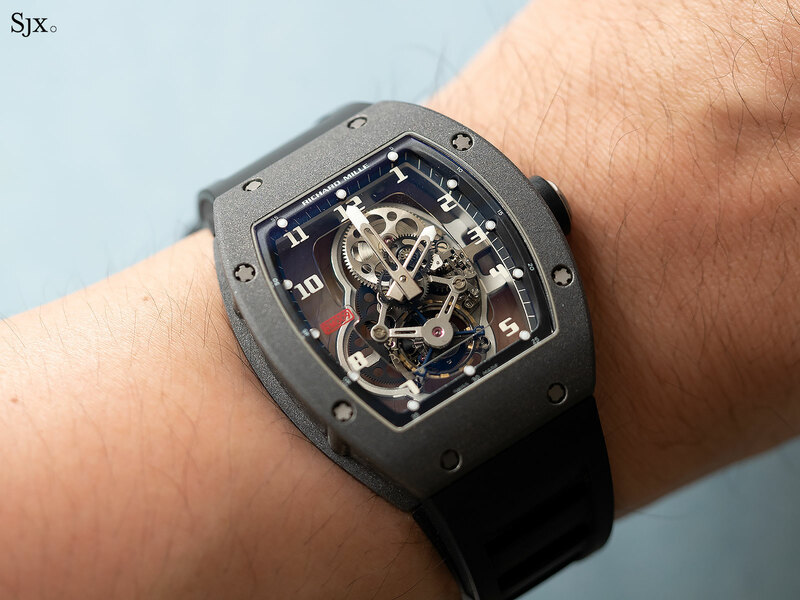 Not just because it was the first, but because the case is not made of carbon fibre composite as all ultra-light Richard Mille watches are today. 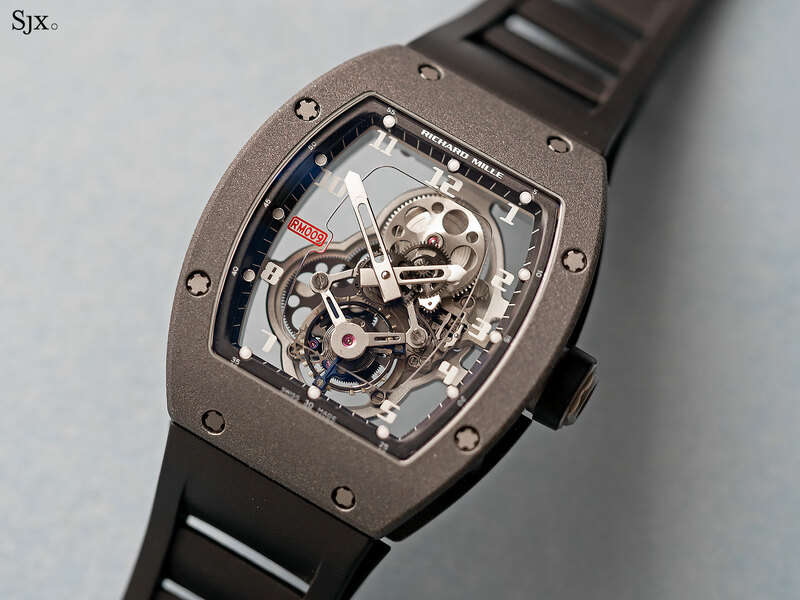 Instead, the RM009 is metal, or more specifically, intriguingly metallic. Like several other Richard Mille watches of the mid 2000s, including the RM011, the RM009 was conceived for the brand’s first ever ambassador: Felipe Massa, the Brazilian driver who was then the next big thing in Formula 1. The same year the RM009 made its debut Mr Massa started at Ferrari, finishing the season in third place. That turned out to be his best finish for the rest of his career, and Richard Mille subsequently acquired other sportsmen and women as ambassadors, including Mr Nadal, who has been consistently winning Grand Slams since 2005. Mr Massa has since retired from Formula 1 and joined electric car-only Formula E, but the RM009 he inspired has gone on to definitively shape the philosophy of Richard Mille, today a superstar of watchmaking that’s the fastest growing high-end brand. When the RM009 was launched it was a revelation, because the ultra-light, ultra-expensive complicated wristwatch had not yet been invented. 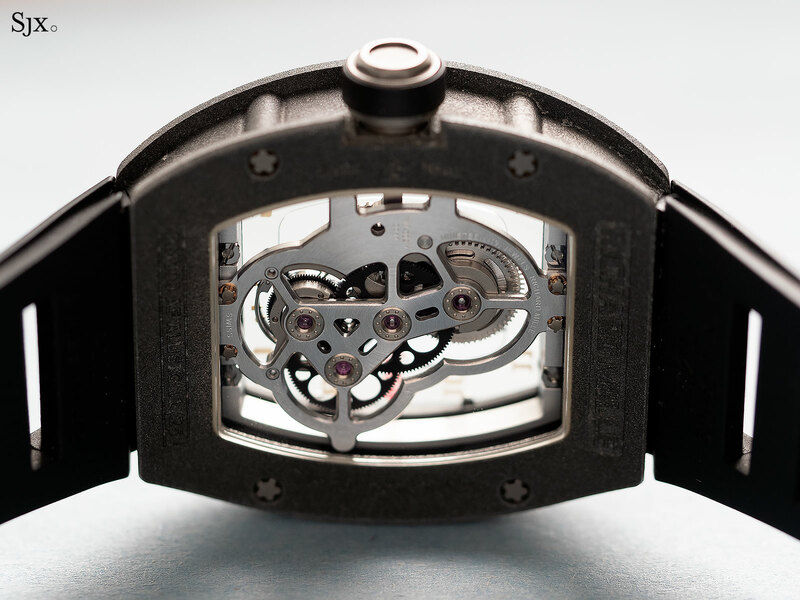 It was remarkable enough that original buyers of the RM009 – bona fide early adopters – were the sort of collectors who also pursued watches from independent watchmakers like F.P. Journe, Philippe Dufour and Voutilainen (and that comes from knowing four of these prescient individuals, although only one still has the watch). Priced just shy of US$350,000, the RM009 was preposterously expensive by the standards of the day, though in hindsight that is a modest sum. 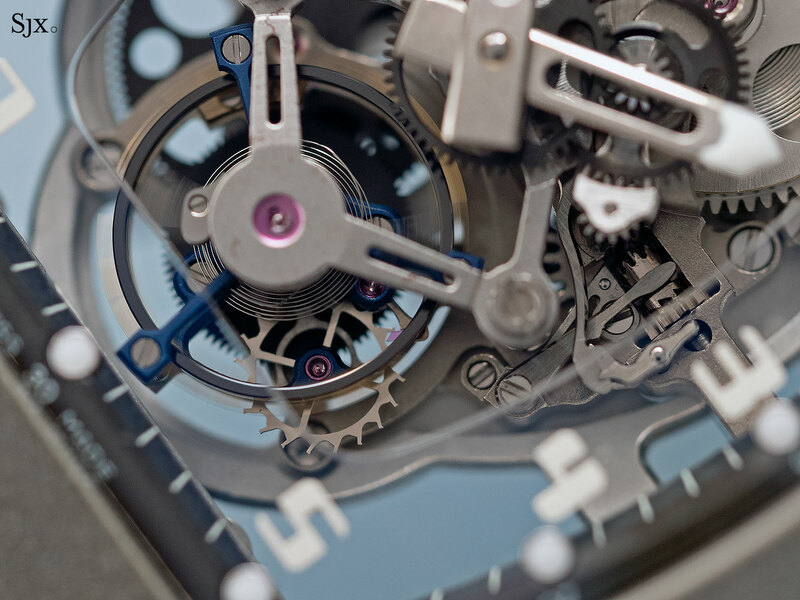 Though it was a tourbillon wrist, the rationale for the price lay not with the complication, but with the exotic materials used for the case and movement, which trimmed the weight of the watch to under 30g. ALUSiC is a metal matrix composite (MMC), usually a low density metal forming the matrix, with reinforcing particles scattered throughout. The material gets its name from its ingredients: a silicon-aluminium alloy that contains silicon carbide (SiC) particles to improve its hardness. Those constituent elements, namely aluminium and silicon carbide, are fairly common ingredients for MMCs, which are typically used for high-wear applications like brake drums and rotors. Other MMCs similar to ALUSiC include Duralcan, invented by the former Alcan (which is now part of Rio Tinto). 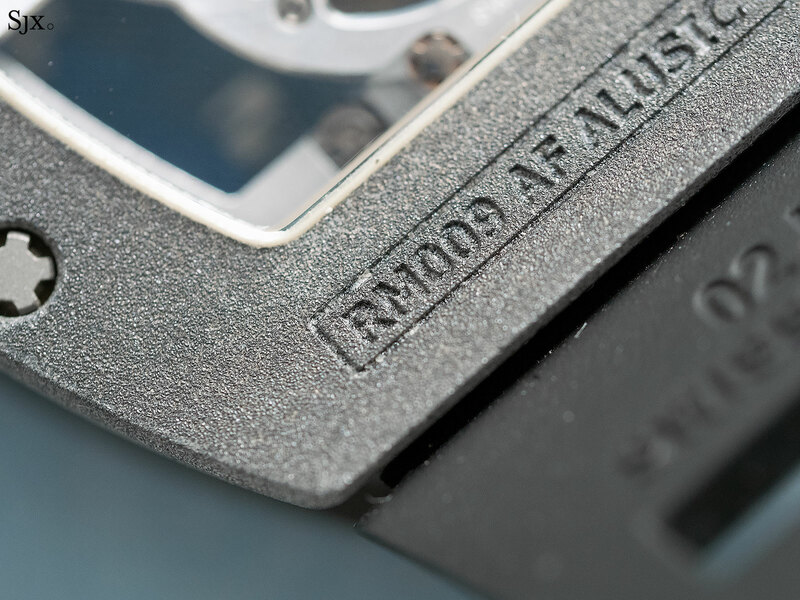 MMCs made of an aluminium matrix with silicon carbide reinforcement particles are known generically as AlSiC, with ALUSiC being the trademarked name for the particular type of MMC used here. ALUSiC is produced by Les Bronzes d’Industrie (LBI), based in the town of Amnéville, which sits in northeastern France bordering Germany. LBI’s specialty is centrifugal casting of metal alloys, a process also known as spun casting. Centrifugal casting creates metal alloys by spinning the molten metal inside a drum rotating at high speed. Once the molten metal cools, it forms a solid alloy ring that is homogenous and free of inclusions. 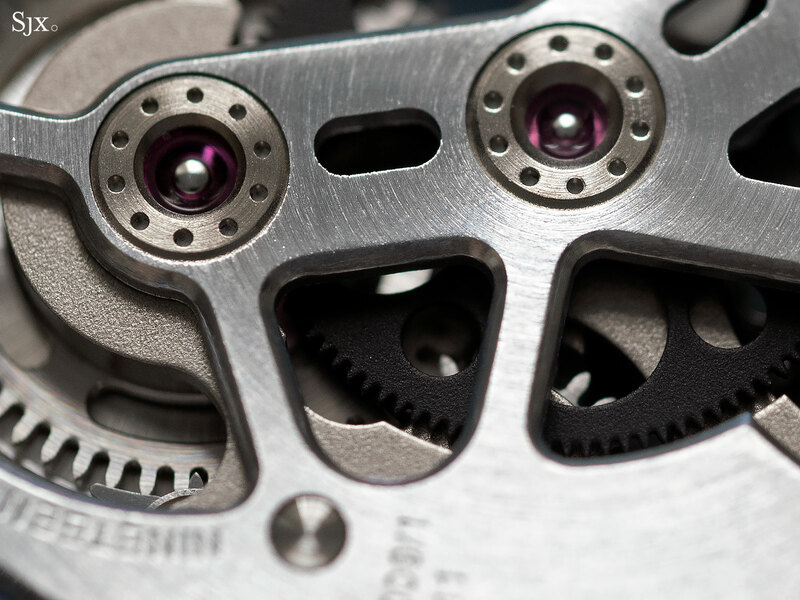 The constituent elements and production process for ALUSiC give it properties ideal for a watch case. To start with ALUSiC has a low density of under 2.95g/cm3, more than a third less than titanium (~4.50g/cm3) and less than half of stainless steel (~8.00g/cm3). That is why the RM009 is lightweight. 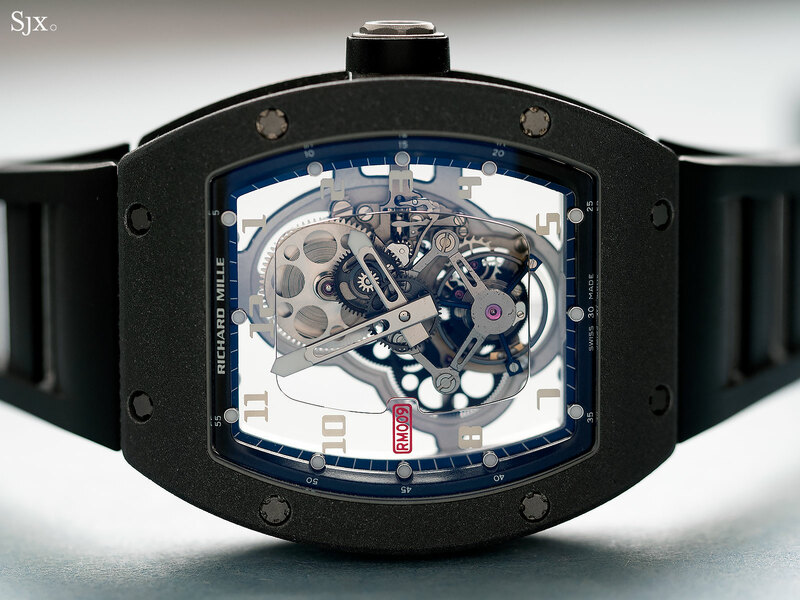 Today’s ultra-light Richard Mille watches have cases (and movement base plates) made of carbon fibre reinforced composites, essentially carbon fibres mixed inside a polymer. Such cases are incredibly light, but also look lightweight. In contrast, ALUSiC has a rough, granular surface that resembles stone, or a heavily abraded metal surface. Because the case resembles a heavy material, the lightness is surprising, time after time. 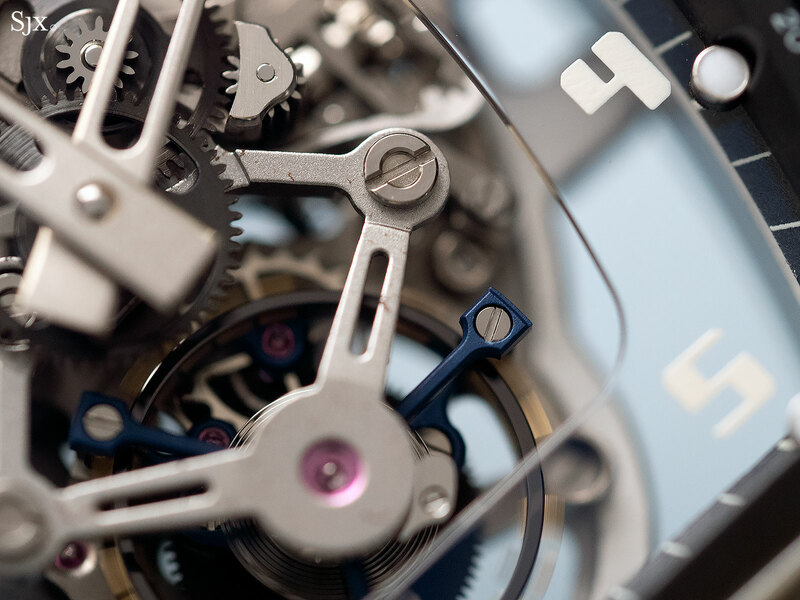 The disconnect between the appearance and feel is one of the most compelling qualities of the watch. 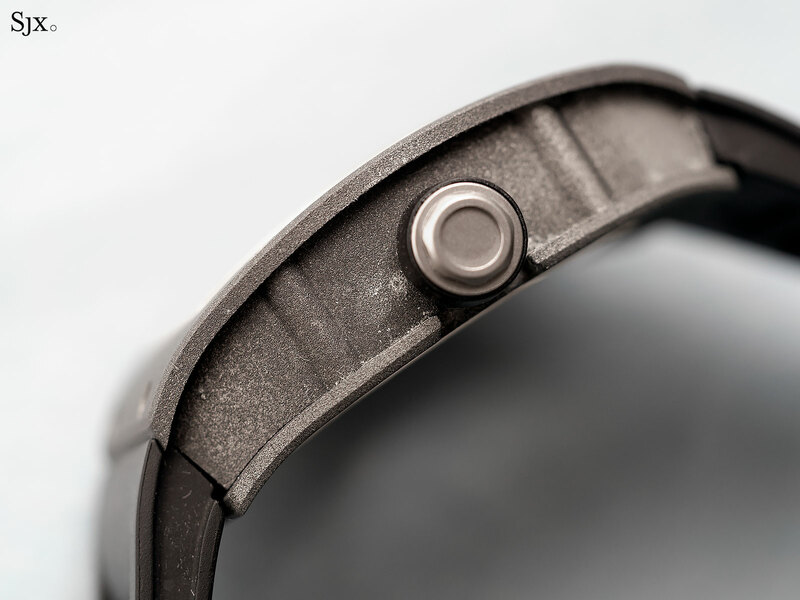 An especially interesting characteristic of the ALUSiC case is the fact it acquires a patina of sorts. 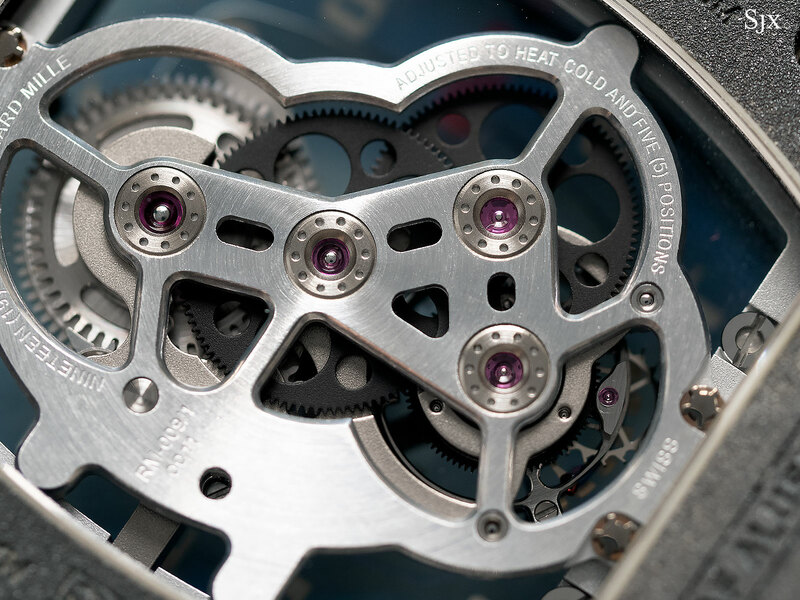 The RM009 pictured was bought brand new by its owner in 2005, and has been worn regularly since. Though the watch has been serviced since then, the case is untouched. 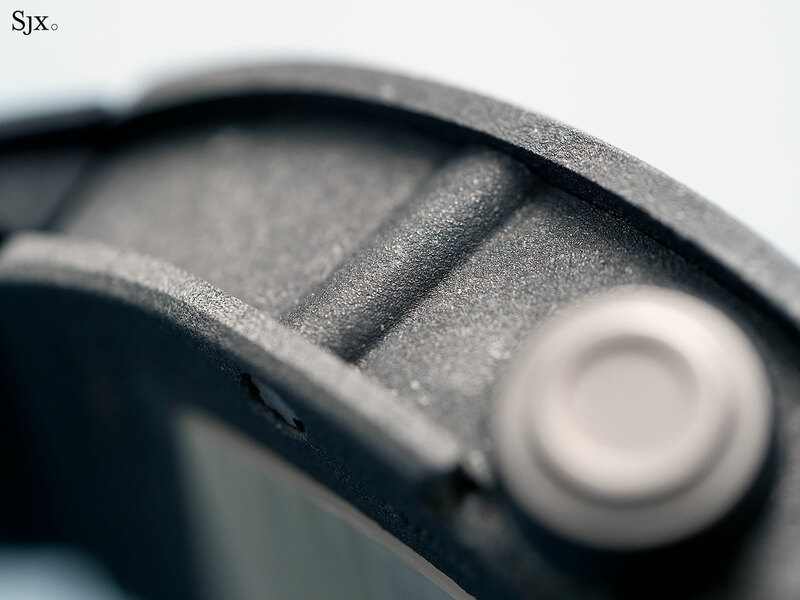 Over time the case has darkened considerably, going from a pale grey similar to natural finish titanium to a dark shade that accentuates the granularity of the surface. 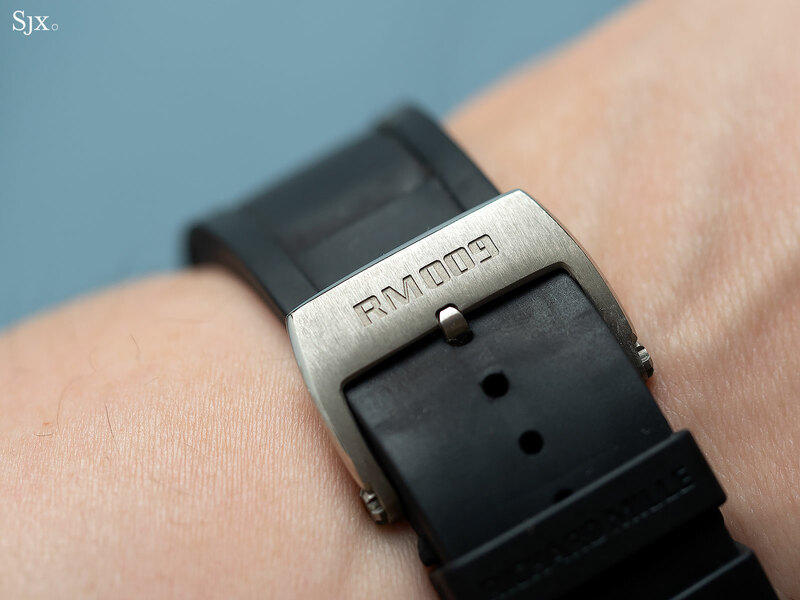 Having seen several other RM009 watches, it is obvious not all RM009s have aged similarly. I don’t know about about MMCs to understand exactly why the case colour has changed, but a cursory look at research available online indicates that aluminium-based MMCs can be affected by seawater, and presumably sweat. That might also explain why small segments of the case surface are speckled light grey, and almost white – perhaps some sort of metallic precipitate? 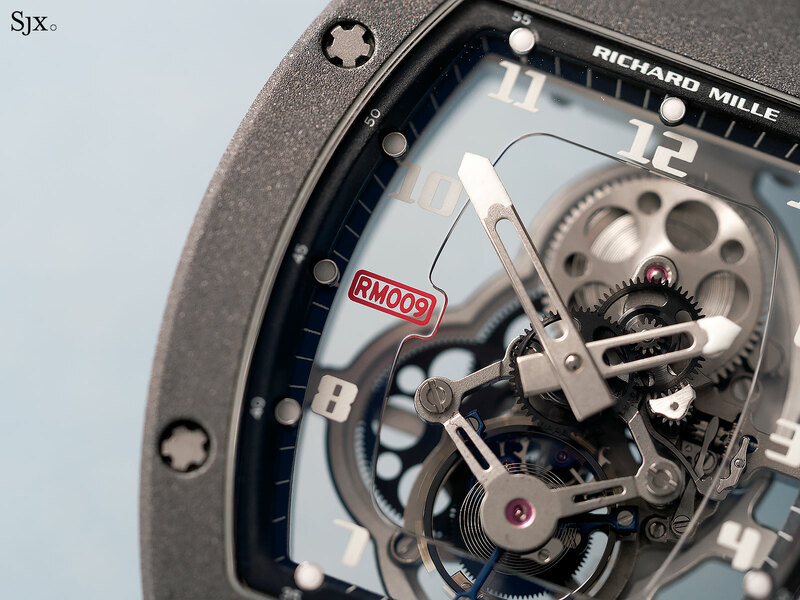 Another first for the RM009 was the material used inside the case – the base plate is made of an aluminium-lithium alloy. Aluminium in itself is already a lightweight metal, but lithium is the least dense metal, so the addition of lithium, even with tiny amounts, makes the resulting alloy significantly lighter. But lithium also strengthens the structure of the alloy, making it more stable over time than aluminium. With a density of just 2.60g/cm3, the aluminium-lithium alloy for the base plate is even less dense than ALUSiC, which has a density of 2.95g/cm3. But the bridges visible on the front are made from an alloy of aluminium mixed with and copper and magnesium, which is likely the reason for the tiny brown spots that develop over time. According to the owner, the brown discolouration is a recurring problem; it’s fixed with every servicing but returns over time. 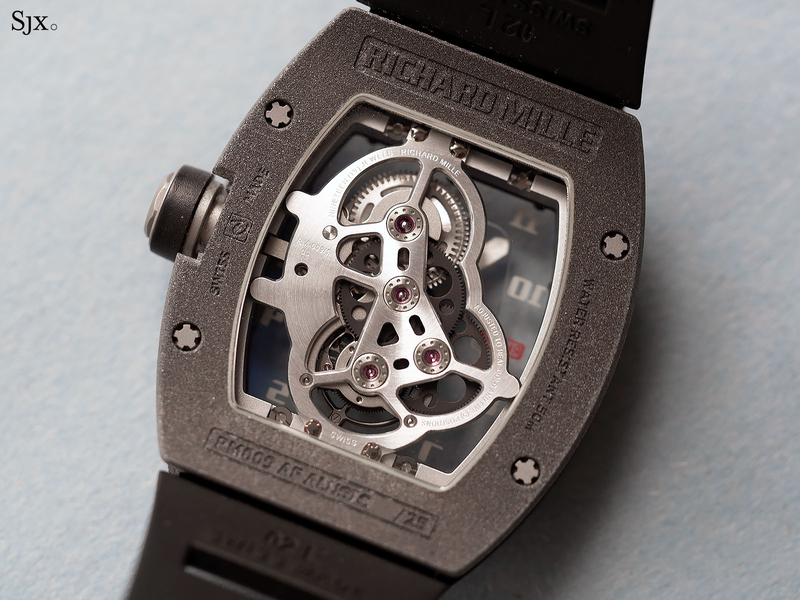 While the calibre is fundamental similar to later Richard Mille tourbillon movements – it was produced by Renaud & Papi, just like the current crop – the RM009 movement is evidently a much earlier work. Compared to today’s movements, the one inside RM009 is rougher around the edges, almost experimental. In fact, and this is an analogy a watch nerd would appreciate, the RM009 calibre is akin to the earliest F.P. 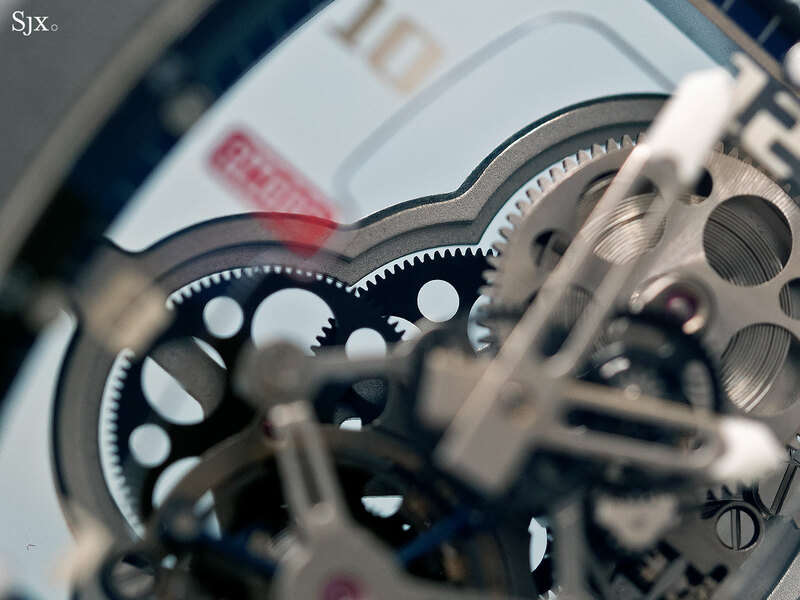 Journe tourbillon movements, looking more hand-made and less refined – and that makes it cool. 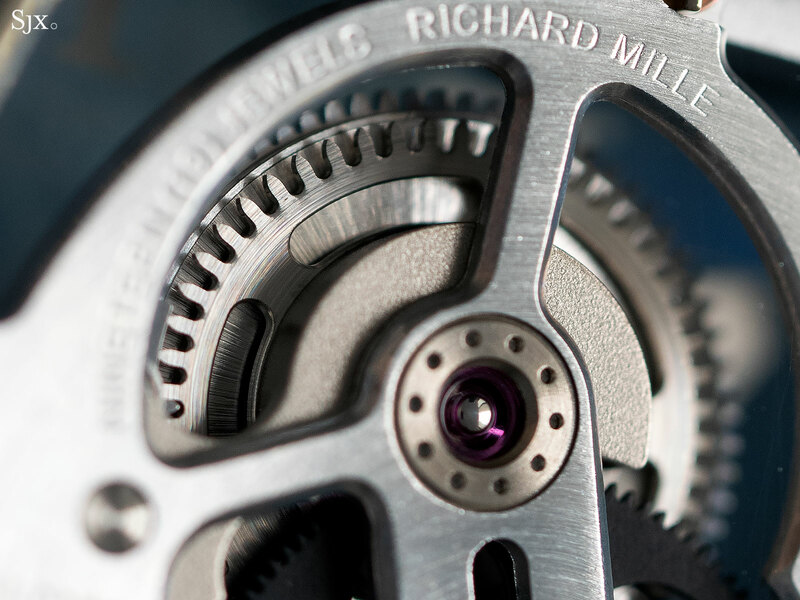 The RM009 will definitely go down in history as a significant watch, but the magnitude of its significance will be determined by the future of Richard Mille. As long as the brand continues on its current trajectory as the definitive brand in the ultra high-end segment of contemporary, complicated watchmaking, then the RM009 will be an incredibly big deal. If the opposite happens, then the RM009 might end up as a historical curiosity. 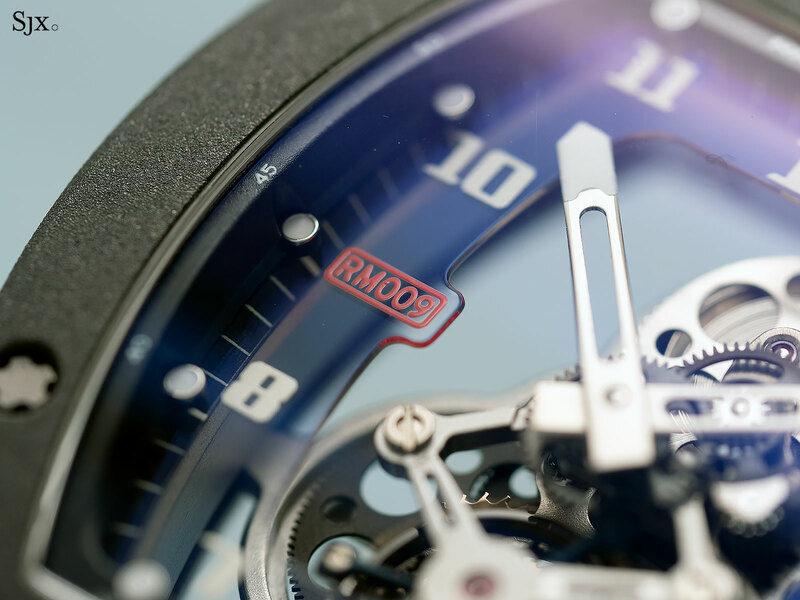 Be that as it may, the RM009 is still an incalculably compelling watch. There is nothing else quite like it – a preposterous, flawed watch built on a bizarre idea that wears like a dream on the wrist.